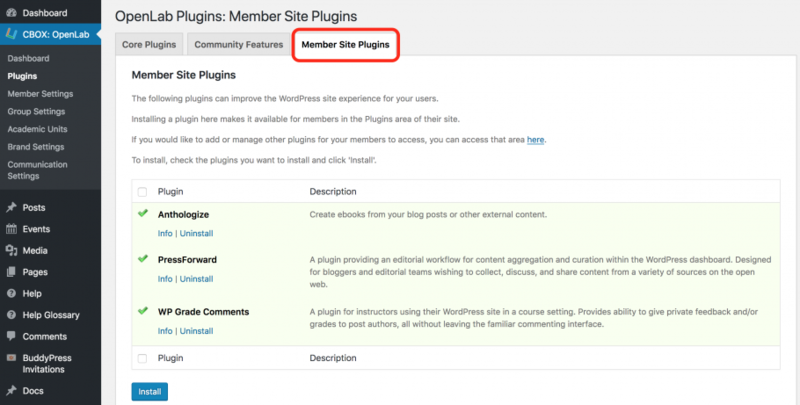 Member Site plugins may be installed or uninstalled by going to Dashboard > CBOX OpenLab > Plugins. To install, check the box next to the plugin(s) you would like to install and click Install. To uninstall, click the Uninstall link beneath the plugin name. If you would like to install additional plugins not shown below for individual member sites, you can do so in Dashboard > Network Admin > Plugins. If an update is available for a plugin, a message will appear here beneath the plugin name and a checkbox will appear instead of the green checkmark. To update, check the box next to the plugin, and click the Install button.